Corrida de Toros Cowboy Scotty Philip set the stage for the 100-year-old bullfight. Cowboy Scotty Philip set the stage for the 100-year-old bullfight. Which is the more aggressive and dominant animal—a Mexican fighting bull (toro) or an American buffalo? Scotty Philip, a cattle trader well known along the Mexican border, decided to find out during the winter of 1906-07. His plan? To ship by rail two bull buffaloes to Juarez, Mexico, for a contest between the two species in the bullring. 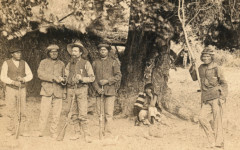 Scotty and his men corralled one eight-year-old bull buffalo and one four-year-old. They loaded each animal into sturdy crates and then manhandled the crates onto two sleds that have been hauled over the snow to Fort Pierre, South Dakota, then across the frozen ice of the Missouri River to the Pierre stockyards at the railroad terminus. Scotty constructed a pen on each end of a boxcar, leaving the center of the boxcar open for hay bales and watering equipment. He and his men then fortified the boxcar’s interior walls with extra-heavy planks to help defend the car from the powerful hind kicks of the buffaloes. Scotty planned to travel with two other men. 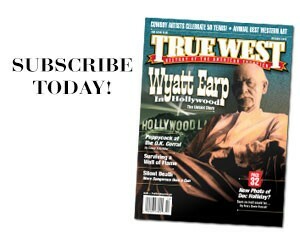 The first was a Texan, Bob Yocum, who owned saloons in Pierre and Fort Pierre. Bob was a major instigator in arranging the buffalo versus bull fight with his cronies in El Paso and Juarez. Bob made sure there was plenty of alcohol in the baggage to make the trip a more pleasant experience, especially across the dry state of Kansas. Eb Jones, a good friend of Scotty’s and an experienced cowhand, also agreed to accompany Scotty. Once the buffaloes were loaded into the boxcar and coaxed into their special pens, a major blizzard hit. Scotty, concerned about his cattle, decided he better stay behind. He asked his nephew, George, to take his place. Scotty trusted George, whose parents had died when the boy was young. Scotty had raised him, training George to be a cowhand before sending him to law school. But since George didn’t yet have many clients for his new law practice, he agreed to take the trip on his uncle’s behalf. Into the raging blizzard, the train pulled away from Pierre. George, Bob and Eb rode with the train crew in the caboose. The train’s first stop was Sioux City, Iowa, where a crowd gathered to see the buffaloes as the men fed and watered them. Bob left the others behind, taking a faster more comfortable passenger train to El Paso to make sure all the fight arrangements were in place (and to socialize with old friends in the Coney Island Saloon). Next stop for George and Eb was Omaha, Nebraska, at two in the morning. The two rented rooms at a hotel for a few hours sleep. They and the buffaloes were to leave on a Rock Island freight train at 6:30 that morning. When George and Eb arrived at the train yard, they panicked; the buffalo car was not attached to the train. After an extensive search of the rail yard, the car was finally discovered on a sidetrack 10 miles out of town. Someone had mistakenly hooked the buffalo car to the wrong train. When the train crew had discovered the mistake, they left the car behind. The train crossed into teetotal Kansas and left the buffalo car at the small town of McPherson where it remained for a 36-hour unexplained delay. George and Eb headed to the town’s pool hall, asking the manager where they might find a beer in the dry town. The man, who happened to be a member of the Fraternal Order of Eagles, took them to a building where the two men drank beer until their train arrived. After the train crossed into Texas, George later reminisced that in “the flattest part of the earth’s surface,” he and Eb broke into their stash of alcohol and shared it with the train crew, except for the conductor who said he would not drink while on duty. The train stopped while the crew switched out some cars. Eb was asleep in the caboose. George got out to “stretch his legs” when the engineer invited him to ride in a locomotive. As George climbed up in the engine, the engineer commented on George and his buddy being stingy since he hadn’t gotten a nip of the liquor they’ve been hoarding. George acknowledged the hint and returned with a whiskey bottle. The engineer guzzled some whiskey and started up the train. He showed George how the engine worked, while he continued to drink out of the bottle. Tooting the train whistle, the engineer started singing bawdy songs. George looked back, noticing a con-ductor running toward the locomotive on top of the train cars. The conductor ran over the coal in the tender, entered the engine and began yelling at the engineer. The conductor tried to take the throttle from the engineer, who repeatedly threw him into the tender after each advance. All along, the speed of the locomotive kept increasing. George saw the distant smoke from a train coming toward them—head on—as the fight continued. George looked behind again. All the crew members were hanging from the sides of the cars, ready to jump. George recalled his buddy Eb, sleeping in the caboose. He closed his eyes and wished he were back in South Dakota. Fortunately, the engineer of the oncoming passenger train found a sidetrack in the nick of time, as the freight train with the buffaloes sped by. After all that whiskey and “exercise” with the conductor, the hungry engineer stopped the train at a town where he knew there was a good restaurant. After seven days on the rails, the train finally pulled into El Paso on the morning of the same Sunday that the buffaloes were to fight the Mexican bulls. 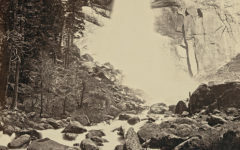 Eb and George located Bob Yocum who had been having too much fun with his old cronies and never made arrangements to get the buffalo car transferred to the Mexican Central Railroad nor cleared the exchange with customs officials. The Mexican officials were uninterested in speeding up the process until the chief official saw that the South Dakotans were fellow Masons and allowed the buffaloes to cross into Juarez in time for the afternoon show. 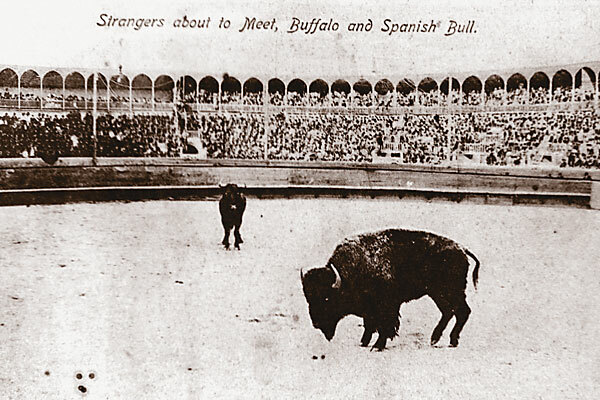 The show included four regular bullfights and then the one Scotty Philip had planned: the American buffalo vs. Mexican bull fight. The larger, older American buffalo was released into the ring first. The buffalo limped calmly to the middle of the ring, having injured a hind leg while kicking at the sidewall of the railroad car, and stood still. When the attendants released a red Mexican bull into the ring, he immediately spied the buffalo and charged. The bull aimed for the buffalo’s flank; but at the last second, the buffalo pivoted and the bull hit him head on. The bull backed away and charged again, hitting the buffalo head on. The bull was knocked back on his haunches. This happened again on the third attempt. On the fourth attempt, the bull again hit the buffalo head on, was stunned and fell to the ground. Then the bull rose up, fled from the buffalo and tried to climb out of the ring. The attendants released four more bulls into the ring. Each attacked the buffalo in turn; but the buffalo defeated them and ended up chasing them around the ring. The crowd roared its approval for the buffalo. The next Sunday, the promoters advertised four bullfights and an American buffalo fight against a matador. The first bull to fight was the bull that had fought the older buffalo the previous Sunday. He refused to fight the matador and only looked for a way out of the ring. The next three bulls also refused to fight the matador. This was unheard of, and the mood of the crowd turned foul. The promoters decided it was time for the matador to fight and kill the buffalo. The attendants released the younger buffalo into the ring. After the buffalo made a few passes at the matador and his cape, the governor of Chihuahua, acting as president of the game who held complete authority as judge, stopped the event and declared that all spectators would have their money refunded. Apparently, he did not want anything to happen to the matador. The American buffaloes might have won in the ring, but not in the end. To help defray costs, the promoters insisted both buffaloes needed to be sold. The South Dakotans were at the mercy of the Mexicans who threatened to throw them in jail if they did not cooperate. The younger buffalo was sold and butchered; the older bull disappeared south of the border. Rumor had it that he continued to fight Mexican bulls … and win. 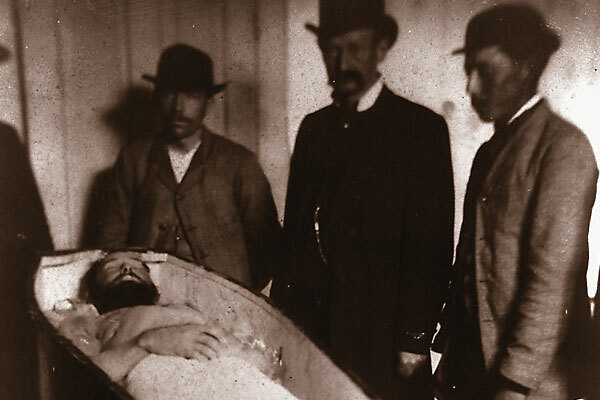 Robbing the Yankees The James brothers and their gang were the right bandits for their time.